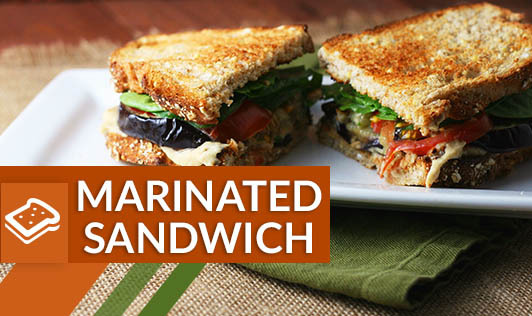 A delicious and colourful sandwich recipe you must try. Baking Temperature : 180°C . 1. Cut each dinner roll into 2 horizontal slices and apply a little butter on both the halves. 2. Bake in a pre-heated oven at 180°c for 2 minutes till each half is lightly toasted. 3. Spread approx. 1 tablespoon of the parsley cream cheese on the bottom layer of the roll and top with the marinated peppers. 4. Sandwich with the top half of the roll. Repeat with the remaining ingredients to make 5 more sandwiches.